We continue in updated form the major new structural feature of the previous edition: a cladogram depicting phylogenetic relationships among animal taxa appears in the inside front cover and serves to order our coverage of animal diversity in Chapters 5–20. The reformatted cladogram from the inside front cover appears in small form at the start of each taxonomic chapter, with the chapter’s taxonomic coverage highlighted on it. References to new primary literature and to updated textbooks were added throughout the book. 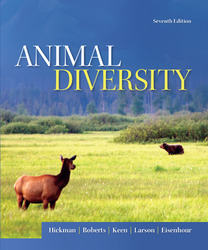 The seventh edition includes an unusually large overhaul of our photographic illustrations to maintain consistently high quality in our depiction of animal diversity. Recent revision of the standard geological timescale has required many updates in our coverage of the historical ages of animal taxa and the timing of major evolutionary events. We have updated throughout the book the major taxa recognized within animal phyla and the numbers of species recognized within them. Key words are boldfaced, which serves as a cross-reference to the glossary for definition, pronunciation, and derivation of each term. A distinctive feature of this text is an opening essay at the beginning of each chapter. Each essay presents a theme or topic relating to the subject of the chapter to stimulate interest. Some present biological, particularly evolutionary, principles; others illuminate distinguishing characteristics of the animal group treated in the chapter. Chapter notes, which appear throughout the book, augment the text material and offer interesting sidelights without interrupting the narrative. Each chapter ends with a concise summary, review questions, and a list of annotated selected references. The review questions enable students to test themselves for retention and understanding of the more important chapter material. The appearance and usefulness of this text are much enhanced by numerous full-color paintings by William C. Ober and Claire W. Garrison. Texts illustrated by Bill and Claire have received national recognition and won awards from the Association of Medical Illustrators, American Institute of Graphic Arts, Chicago Book Clinic, Printing Industries of America, and Bookbuilders West. Bill and Claire also are recipients of the Art Directors Award. At the end of each survey chapter is a selection of related Internet links. The URLs for the pages are in the text’s website at www.mhhe.com/hickmanad7e . Susan Keen is Lecturer at the Section of Evolution and Ecology of University of California. David J. Eisenhour an Associate Professor of Biology at Morehead State University.